This analysis is written by Alexandre Macmillan and Michail Katkoff . Both of the authors are true fans of Command & Conquer franchise and both of the authors understand all to well how hard it is to ship a hit mobile game. To make sure you don’t miss on all of the 🔥content coming out in the future, please do subscribe to the Deconstructor of Fun infrequent but powerful newsletter. No matter how you look at it, Command and Conquer Rivals is a good mobile game and the team behind it should be proud of the game they shipped. It’s polished. It has high production values. The game is built around a nostalgic strategy game franchise and it offers a novel gameplay combined with familiar metagame. It was also launched successfully with a combination of pre-launch hype, featuring from the platforms, support from top influencers and a robust user acquisition campaign. Yet just after a month it was clear that the game is not going to scale up as EA was likely hoping it would. There just wasn’t any meaningful market space to be taken from the category dominated by Supercell’s Clash Royale. 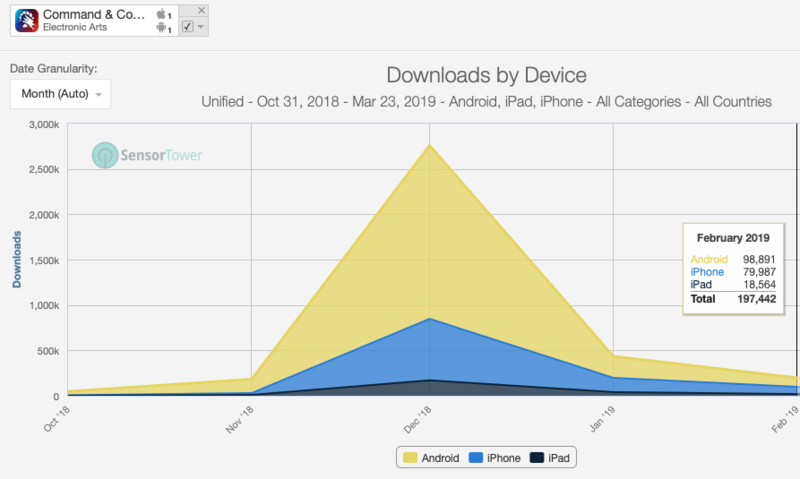 C&CR gathered almost 3M installs during the launch month. While an impressive number, it is likely less than EA was hoping for. Based on rapidly dropping installs one could argue that the game is unscalable. Net revenues peaked at almost 2M on launch month. As the installs dropped, so did the revenue. Though the decline of revenue is not as steep supporting the above average retention. Nevertheless, the game is making around a million in revenues just 3 months post launch. This has to be a major disappointment to EA Mobile. In many ways, Command and Conquer Rivals takes the same steps as several other titles, which attempted to take a piece of the pie from the category defining Clash Royale. In the end, if there’s only one thing for you to remember from this analysis, it’s that a publisher needs to constantly analyse the market and avoid positioning its game directly against an established category defining hit. Unless you have a control over a distribution channel (example: Valve + Steam and Tencent + WeChat) or you’re targeting a region / audience the category leader has neglected (example: Garena Free Fire big in South America and Knives Out big in Japan). The strategy of taking a piece of the pie from Supercell has been proven unsuccessful for the last 7 years - or ever since Clash of Clans launched. Command and Conquer is a monument of video games culture. It spawns over 2 decades and 18 titles. It’s safe to say that the franchise has a rich history and a dedicated fanbase, including one of the writers of this post. Having such a nostalgy hungry fanbase is a great asset. But it can also be a challenge as previous iterations from an over a decade ago build unrealistic expectations and place the bar very high. The weight of nostalgia can be heavy, and your biggest fans are also – rightly so – your most demanding ones. Traditional fans of the series had already voiced their frustration and disappointment at the mobile game. In this it resembles the fans’ reaction when Diablo Immortal was announced. And sadly, it all felt like deja vu going back to announcement of Dungeon Keeper on mobile. Four years ago EA challenged Supercell’s Clash of Clans with a similar game that had a nostalgic PC brand and distinctive gameplay innovations. It didn’t go well. Four years later EA challenges Supercell’s Clash Roayle with a similar game that has a nostalgic PC brand and distinctive gameplay innovations. This type of reaction in not uncommon when bringing any historically PC-first series to mobile. There is always the risk when going from PC to mobile that you don’t provide the vocal original fans what they love about the series. But to be fair, it also seems like there simply is a stigma surrounding mobile games with that passionate group of gamers. The conversations on Reddit with the production teamreflect a visceral resistance to the free-to-play model, which overall questions the decision to go forward with the IP. But the biggest problem with the game doesn’t have to do with the way it adapts the Command & Conquer experience to mobile. Rather,the biggest problem, in our opinion, is that the game doesn’t build a great real-time PvP experience that could rival Clash Royale. And from all the data we have seen, the Command & Conquer, nor any other IP, hasn’t proven strong enough to have players overlook those key shortcomings. Above you can watch one of the top YouTubers for Supercell’s games, Chief Pat, featuring Command & Conquer prior to the game’s global launch. It was clear that EA positioned C&CR against Clash Royale going as far as hiring the same influencers. It was also clear that this positioning was not resonating with Clash Royale fans when looking through the comments. Command & Conquer Rivals is clearly heavily inspired by Clash Royale. The game keeps a lot of the strong points that makes the category such a great fit for mobile. Matchmaking is fast and a few minutes is all you need to pick up the game and have a fun match. The game also capitalizes on the strong emotions that accompany winning or losing against another person in real-time. Most importantly, the game offers true innovations for players who enjoy strategic head-to-head game play on mobile. In C&CR, there are 3 functionalities for the troops: spawning, moving and attacking. Players spawn the units, then determine where they go, and what they attack. The player must manage units’ movement and attacks throughout the match because units will stand still until they are directed to march, or they are destroyed. The game is about controlling space. That’s why units aren’t autonomous. The default mode of troops must be to stay in place to ensure players can control the missile platforms. Unit movement on the map supports arguably one of the most compelling features of the game – fog-of-war. Players can only see the map within a specific perimeter of their troops. Player can always see if a launch pad is controlled or not – but if that area is hidden, then the player doesn’t know what troops are controlling the capture point, or how many troops are waiting in the background. As a player’s units move throughout the map, they unveil the fog of war. This provides the opportunity to prepare for strong troop build ups and create surprise attacks. This is particularly the case at the beginning of a match, when each side is preparing and building up its troops. In Clash Royale players must carefully decide the spawn location. Once the unit is spawned, it’s on auto-pilot and the player cannot directly affect that unit. That provides the players with a holistic vision of the match and the battlefield. On the contrary, in C&CR there is a default spawn location. But once the unit has been spawned, the player must manage that unit until the end. And most battles end up being only about one of the missile platforms on the map. The key problem with giving players the full control of the units, is that the game introduces new levels of controls which instead of adding depth actually reduce the user’s experience. Having to manually determine where troops go and what they attack requires a cognitive effort which grows with every new unit spawned. While this design increases control – and in theory depth – it mostly adds a cumbersome layer of micromanagement, which takes the focus away from seeing and responding to opponents moves. In addition, because of this micro-management, it’s hard to focus on more than one front at a time. The complexity to interface with units means it’s easy to get tunnel vision and ignore large aspects of the battle. And since there are two to three missile platforms to fight for on a map, it often leads idle areas appearing on the map. The control system is a key illustration of the game’s struggles to deliver in terms of immediate gratification. Another example of this is the game’s win condition, and the extent to which different strategies are encouraged and discouraged by game design. In short, the added control makes the game less strategic by pulling players focus from observing and reacting to opponent’s movement into micro-managing single units. Turning the gemeplay into a laborious effort instead of an exciting or strategic match. The game pits 2 players head to head for matches that usually last 3 to 4 minutes. Each player has a base, and the goal is to destroy your opponent’s base.The player destroys the opponent’s base by sending missiles at it instead of attacking the base directly with your units. It takes two missiles the evaporate your opponent. In order to fire a missile at the opponent’s base, players need to control the various capture points (the “missile platforms”) located on the map. To control a capture point, players need to position troops on them. The player who controls the most capture points makes the missile progress bar increase. If each player has a unit on the same capture point, that capture point is contested and no one controls it. If there is a stalemate – where each player controls the same number of capture point on the map – then the progress bar pauses. 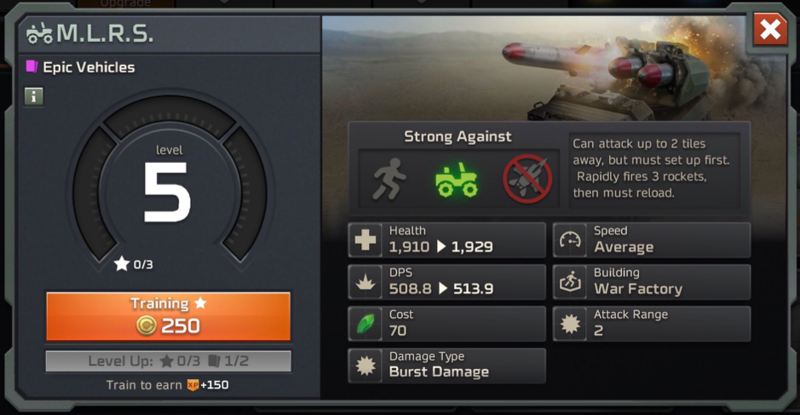 When the missile bar is full, a missile is launched. Whoever controls the most capture points when the missile bar is full sends a missile on the opponent’s base. What matters is controlling the capture points when the progress bar is full. It’s not about controlling capture points for a required amount of time. To be fair, firing missiles is not the only way to damage the opponent’s base. Players can send troops to directly attack the opponent’s base. But “base dash” is not an efficient and viable strategy. Each missile depletes half the base’s hit points – so unless troops directly damage the base for half its HP, the damage inflicted on the base does not impact the course of the game. And by design, most troops only do chip damage and/or can be easily disposed of by the appropriate counter. Attacking is an indirect path to victory. In C&CR is not about attacking your opponent’s base nor is it about attacking your opponent’s troops. It’s about having your units on the capture points for a set amount of time.Compared to Clash Royale this feels counterintuitive and less gratifying. After all, taking down opponent’s troops and then the opponents base is the most immediate and gratifying feedback players look for in a real-time head-to-head game. The mechanics underlying the missile launch remove the potential for great all-out attack moments that could have been one of the key selling points of the game. Unfortunately, players can’t fully capitalize on the subtleties of the missile launch by sweeping in to control the zones at the last moment. C&CR does not encourage fast reaction and quick strategic shifts. The game features artificial cool down timers, which prevent player from spawning troops despite having the resource to do so. This slows down the match and prevents many strategies players could employ. Basically, everything needs to be planned ahead. The way players accumulate and consume Tiberium, the in-match currency, precludes users from building strategies around surprise attacks and last-minute comebacks. When you think of Tiberium think of Elixir in Clash Royale. But there are some key differences. In Clash Royale, things are simple. There is an Elixir cap – players can’t stock up more than 10 Elixir points at a time. But if a player has enough Elixir to spawn a troop, s/he can spend it. Because of that, maximizing Elixir spending is a core part of the strategy. In fact, one of the key stats tracked in the Clash Royale League is Elixir leaked. Because of this, having fast-cycle swarm decks is an option for players in Clash Royale. In C&CR, players can accumulate all the Tiberum they want – there is no Tiberium cap. But players can’t freely spend their Tiberium when they want. Having enough Tiberium is not the only requirement to spawn a unit. In addition to the cost to spawn a troop, there is a cooldown. After spawning a troop, players must wait before spawning the next troop. The length of the cooldown varies depending on the number of troops the player has active on the battlefield. When the player only has one troop on the battlefield, the cooldown is close to 0. The delay increases the more troops on the field. And once users have 6 troops on the field, the time between potential spawns increases dramatically. The designers on the game clearly faced a balancing dilemma. With the current Tiberium generation pace, if users were able to spawn riflemen (the cheapest unit to spawn) unimpeded, the battlefield would overflow with troops making the game unmanageable given the micromanagery control system. On the other hand, if the Tiberium generation pace was slower, some more expensive units could never be played in a match. To fix this problem, we assume, the designers introduced a cooldown system. The cooldown helps to ensure expensive troops can be spawned, without risking the map being overtaken by cheap units. But the way the self-made problem was fixed feels unintuitive. Having two levels of requirement to spawn a troop (cooldown + Tiberium), is one of the main factors causing the game to feel so slow. Looking at the cost of different units, it seems like the spread in Tiberium cost is too wide to have a good experience and reconcile all available troops. Players can spawn 25 riflemen within the same amount of Tiberium (or time) it would take them to spawn the Mammoth Tank. The problem is not that players accumulate Tiberium too quickly or too slowly. It’s that there is too wide a spread in the Tiberium cost of units. The spread of unit cost in Command and Conquer is too wide – that’s what makes the cooldown especially important. Cool down timers are placed due to troop cost balancing issues. That is why the feature feels artificial. In Command and Conquer Rivals, you need to reconcile a very wide spread. And this is where the comparison with Clash Royale hurts the most. In Clash Royale the most expensive unit costs 9 times what the cheapest one costs compared to 25x for Command and Conquer. In addition, there are very few units that cost 7, 8 or 9x what the cheapest one costs. The distribution of units in Command and Conquer is much flatter. And there are relatively too many low-cost units. As of January 2019, in Clash Royale 68% of available units cost between 3 and 5 elixir. If you were to compare at the same scale in Command and Conquer Rivals for the GDI faction, 50% of available unites between 3 and 8 units. A better balance of unit cost in Command and Conquer would remove the need for a cooldown altogether. And also give players the opportunity to have more all-out attacking strategies. We believe that the units’ balancing and Tiberium cost is one of the profound issues in the game, which spawns additional problems as designers try to patch it up. Because of this cooldown, users cannot quickly react to an opponent’s actions. Swarm decks are simply not an option. This leads to a situation where the units a player brings to a battle only marginally impact the deck’s speed because the cool-down between spawns depends on how many units a player has on the battlefield – not on the respective cost of each units. In other words, the way spawning is designed makes Command & Conquer Rivals less tactical of a game by limiting deck strategies. Unlike Clash Royale, there is no deck cycle that would randomize the order in which a troop can be spawnedand to prevent the user from continuously spawning the same unit. In C&CR each unit has an associated building. In order to be able to spawn a unit, players must first unlock their spawn building for a one-time Tiberium cost. And once those buildings are unlocked, players can spend Tiberium to spawn troops. And yes, players can then continuously spawn the same unit if they want to. Users go to battle with a deck that features 6 units and a commander. The commander determines the base’s HP. Each commander also has a unique special skill: one commander can spawn a turret, another spawns a defense building, another a drone that flies around the map healing troops and so forth. There are three categories of units in the game (foot, vehicle, air) and a rock-paper-scissor system at play, which should be familiar for those who have played C&C games before (comment below if you remember how to destroy a tank with a single bazooka guy in the original C&C). Rock-paper-scissors is clear for new and those familiar with the franchise. Units’ power progression is much like in Clash Royale except that power curve have more steps due to each unit level having sub-levels. Tiberium is the in-match resource players consume to spawn troops. Tiberium naturally builds over time. In addition, players can choose to buy Harvesters during the match to accumulate Tiberium faster. Each player can have up to 2 Harvesters active at the same time on the map. That means there are 3 different speeds at which users can accumulate Tiberium. Each unit has a specific Tiberium cost, which correlates with the power of the unit. Both buildings and units cost Tiberium. So in theory, players that invest into Harvesters early on will have Tiberium and those power advantage towards the end of the match - if they survive till the end. Yet this classical strategic choice of resources versus units is hampered by the artificial cool downs described in the previous chapter. Lack of randomness in combination with the slow pace and limited set of strategies focused around controlling points on the map makes the game feel repetitive. Most importantly though, without element of randomness players can’t blame their poor luck for losing a game. And any of us would rather blame our luck than our skills for losing a match, right? Playing matches is the main source for all the resources that matter in the game. Playing matches also indirectly provides users with the crates they need to acquire new units and upgrade them. In other words, the gacha system is pretty much identical to Clash Roayle. The biggest innovation to the progression system comes from the introduction of the 2-league path. When players unlock level 9, they also unlock the Nod faction aka. the “dark side” of the series. Each faction has its own units, as well as its independent league. Having both paths in the game helps further extend long-term engagement with the game for the biggest fans. While it feels like more could be done to incentivize players to play actively in both paths (for example, reach a specific league with the Nod faction to unlock a cool feature/troop for your GDI team), this is a strong way to mitigate the “archetype effect” all online PvP games are subject to. Level 9 onwards, players have 2 separate decks to take care of, and 2 different leagues to progress in. It effectively doubles the number of cards players care about and invest time and resources into. Players gain medals when they win a match and lose medals when they are defeated. The number of medals a player has determines his/her league. There are few interesting innovations in the league progression system. Unit unlock is not tied to league progression. Levelling up is what unlocks access to new cards in the crates. Because card unlock is not tied to league progression, but XP accumulation, this means the game rewards engagement over skill. Prioritizing engagement over skill is typically a good rule of thumb in free-to-play games. But one could argue that in competitive head-to-head progress should stem out of wins instead of matches played. C&CR doesn’t provide the user with enough immediate gratification. The gameplay requires too much cognitive effort, and the game doesn’t reward simple head-to-head attacks. The pace at which players spawn units is too slow to allow players to turn the situation around and make a last-minute comeback. The way units and spawning are balanced further reinforces the game’s slow pace and decreases the amount of strategic choices. Think of it this way: Clash Royale is boxing. You faint and jab before throwing a cross. Opponent parries and throws a hook to the body. You’re down but not out as you always know that one well-placed punch can still result in a glorious knockout victory. C&CR is Olympic wrestling. It’s a battle of attrition, stamina and perseverance. It’s all about slowly building up dominance and holding a position. As a result, the game doesn’t feature fast pace, moment-to-moment action, and the feeling that “anything can happen until the last second”. The feeling that make combat sports and mobile PvP games enticing for a large audience. And this is not saying that boxing is better than Olympic wrestling. It’s just different. Clash Royale is all about feints, counters, parries and knockouts while Command & Conquer Rivals is a slow and methodical grind to a point victory. We believe that C&CR’s inability to scale up and climb up the charts is due to the game being too much of an RTS for a mobile game. It is a much more of a cerebral game than other entries in the real-time PvP genre. The game requires significant planning ahead. It is more about slowly building dominance rather than being swift and thinking on your feet. In Command and Conquer Rivals, a match can be a wrap long before it’s over. That’s good for an RTS game, but not for a mobile game. There are some key innovations that make Command and Conquer Rivals unique and stand out in the genre. And there are some clear strengths to the game as well, which could serve as a basis to focus on more immediate gratification - such as making direct, quick attacks a viable strategy. But we also understand that these type of big changes should have happened early in development or during soft launch the latest and it’s unlikely that drastic gemeplay pivots will occur post launch. 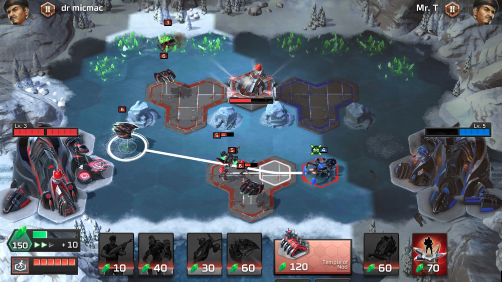 The way we see it, the biggest problem with C&CR is not that it’s not enough of an RTS on mobile – even though that might be the case for Command and Conquer fans. The game’s problem might be that it’s too much of an RTS to appeal to a large mobile audience. Ultimately Command and Conquer Rivals is a true mobile RTS as it was very likely intended to be.